1 of 3 Stir together tomatoes, yellow pepper, celery, cucumber, onion, 1/4 teaspoon each of the salt and black pepper, the olive oil and vinegar; set aside. 2 of 3 Sprinkle fish with remaining 1/4 teaspoon each salt and pepper. Place flour on plate. Dip flesh side of fish (not skin) in flour, shaking off excess. Heat a large nonstick skillet over medium-high heat. Coat pan generously with nonstick cooking spray. Add fish to pan, flesh-side down, and cook 3 minutes. Flip and cook an additional 4 minutes or until fish flakes easily. Remove fish to serving platter and keep warm. 3 of 3 Meanwhile, heat a medium-size skillet over medium-high heat and add tomato mixture to pan. Cook 4 minutes, stirring often. 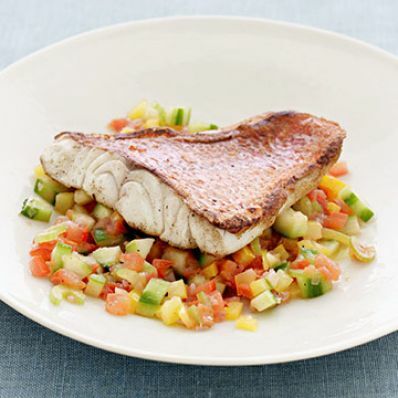 Serve salsa with fish immediately.